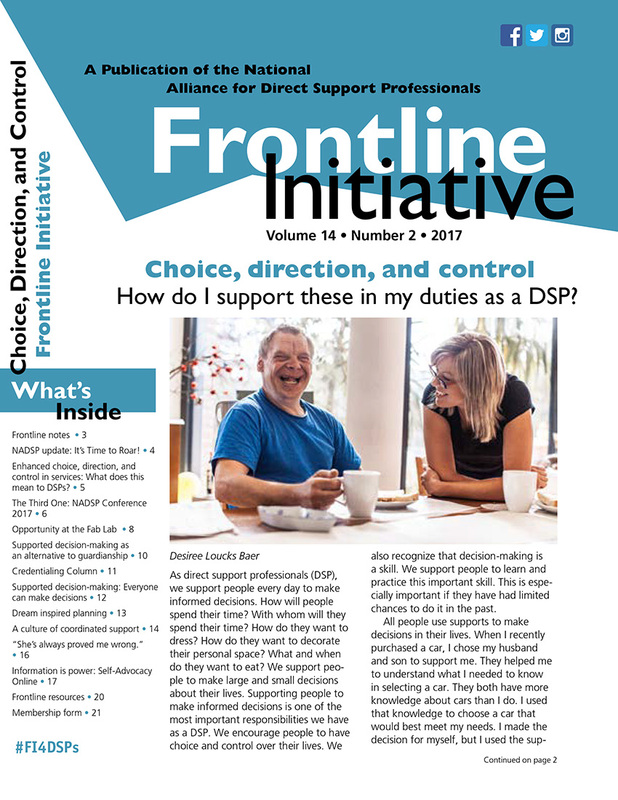 Frontline Initiative is a newsletter published since 1996 that covers issues important to Direct Support Professionals and Frontline Supervisors who support people with intellectual and developmental disabilities and other disabilities in a variety of community settings. Each edition contains resources, perspectives, and strategies to advance the profession of direct support. Examples of topics covered in Frontline Initiative are person-centered practices, trauma-informed care, and DSP recognition. Below you will find the two most recent editions of Frontline Initiative. To view all archived editions of Frontline Initiative you need to have an active NADSP Membership. Access to this archive, which includes dozens of previous editions, is just one of the many benefits of NADSP Membership. In this issue, we recognize the changing role of the Direct Support Professional (DSP). We highlight public policies that can support your changing role, and ways that you support brighter futures. We focus on the successes of self-advocates, DSPs, and others who have taken and are taking action to improve quality of life for those they support through implementing person-centered practices and advocating for needed change. We hope these stories inspire you in the crucial work you do. In this issue, we focus on how to support peoples’ choice, direction, and control. Critical culture and policy changes are impacting the ways direct support professionals (DSPs) provide supports. Our aim in this issue is to make you aware of these changes. We also want to provide you with resources to help people make choices, take direction and feel control over their lives. This starts with helping people make day-to-day decisions in the ways we provide supports. In addition to viewing archived editions of Frontline Initiative, through NADSP Membership you will have direct and exclusive access to information, resources, tools, and training to improve the knowledge and skill set of the DSP workforce, and the quality of life for people receiving services. These benefits include webinars, E-Blasts, events, discounted registration, and more!